I've had a bit of a hard time coming up with goals I'd like to achieve this month! Nearly half of my month is going to be spent on vacation (saaayy whaaaat! ), so it seems a little counter-productive to think of things I'd like to accomplish. Cause I mean, the whole point of vacay is to laze about, forget all your worries, and accomplish a bare minimum of things. My main goal has to do with all that vacation type stuff: I want to try and forget my worries and allow myself the chance to relax. See also: keeping up my positive attitude, and focusing on/ enjoying the present moment more! Keep up with my daily yoga routine! When I'm not feeling motivated, I need to remind myself how awesome I feel after even the tiniest session of yoga. Remember to watch what I'm eating and make healthy choices. Even in the face of delicious vacation feasts. Manage my funds as well as I can! This month is gonna be a toughie. I need lots of balancing and budgeting! I suppose that's it for February so far! 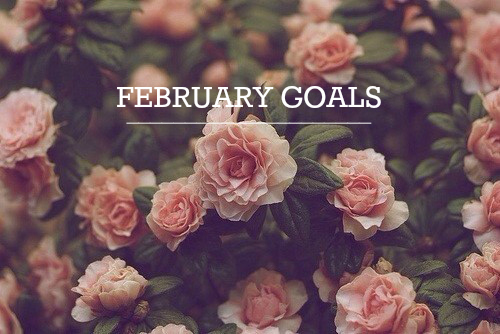 What are some goals you guys have this month? ?